SA imports 42 million bottles of Scotch a year – and those producers have gone to the courts, successfully, to stop the rollout of ‘whisky-flavoured’ cane, the Royal Douglas and King Arthur brands. Last year, South Africa imported 42 million bottles of Scottish whisky – more than one bottle per adult in the country. This makes the country the ninth largest market for Scotch whisky in the world, measured by volume, according to the Scotch Whisky Association. Owners of brands like Glenfiddich, Dewar’s, Johnnie Walker and Chivas are all members. Some £94-million (around R1.8-billion) of Scotch whisky was exported to South Africa last year. And judging from a recent court case, whisky exporters are not tolerating any interlopers – especially not “whisky flavoured” cane. Scotch whisky is heavily regulated worldwide, and producers are required to comply with strict rules before they can put “whisky” or any other inference to Scotland on a label. Only certain inputs (cereal grains, water and yeast) are allowed, it must be distilled in Scotland and the liquid must be matured there for at least three years, in oak casks. 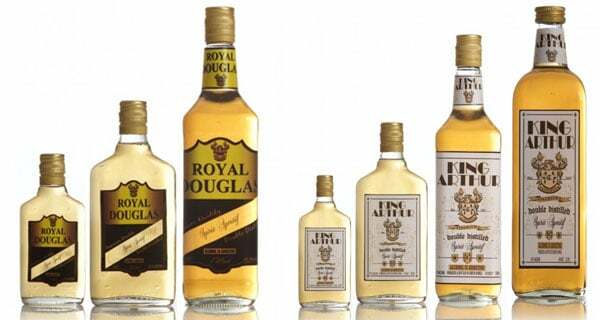 Last week, the Pretoria high court issued an interdict against the South African producer of the King Arthur and Royal Douglas “whisky-flavoured spirit aperitifs”, Netwerk24 reported. The SWA contended that the public could be mislead by the products’ colour, labelling and brand names into thinking they were buying whisky. “Courts across many jurisdictions have ruled that Scottish names, such as ‘Douglas’, and images, such as tartan, are so strongly associated with Scotland and Scotch Whisky that they cannot be used on other whiskies of any other origin,” SWA legal counsel Andrew Swift told Business Insider SA. “The SWA has consistently taken action in our global markets to prevent the use of Scottish and UK indications of origin on whisky which is not Scotch Whisky. This is vital to protecting Scotland’s national drink and is a deterrent to those who seek to take advantage of the quality reputation of Scotch Whisky and potentially mislead consumers. But the South African company behind the brands will appeal the decision. Sean Haupt of Milestone Beverage says that the products clearly state that they aren’t whiskies, but falls under the “spirit aperitif” class of liquor. He says their products are “vastly different” from whisky – it’s not matured, sugar is added and the flavours are not from raw materials. But judging from the price list of at least one South Africa wholesaler, King Arthur was listed in the whisky category. It is currently selling for R859 for a case of 12 bottles (around R72 a bottle) – almost a third of the price of Bells and Jack Daniels.